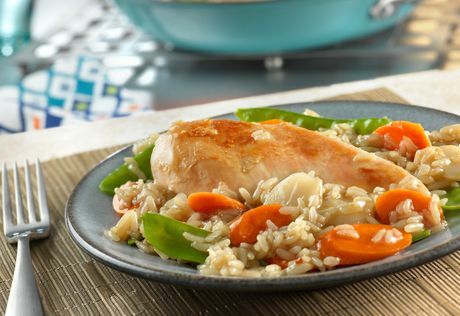 Ready in just 30 minutes, this subtly-flavored stir-fry is enjoyable for adults and kids alike. Plus, you can control the amount of spice in this dish by changing the amount of crushed red pepper to your liking. Stir the broth, cornstarch, honey, vinegar, soy sauce and pepper in a small bowl until the mixture is smooth. Cook the chicken in a 12-inch nonstick skillet over medium-high heat for 10 minutes or until well browned on both sides. Stir the broth mixture, carrots and water chestnuts in the skillet. Cook and stir until the mixture boils and thickens. Stir in the rice. Reduce the heat to low. Cover and cook for 5 minutes or until the chicken is cooked through and the rice is tender. Stir in the snow peas and cook until the mixture is hot. OOOOPSY my shopper got boneless chicken thighs but it took about 4 to 5 minutes per side depending on thickness and it turned out great. If you use more meat than asked for I recommend putting the sauce in an empty pan and adding the rice after boiling then putting the meat to finish so the rice cooks in a timely fashion. This was delicious and I will be trying it again. Family loved every bite. I subbed flour for cornstarch, white for brown rice, and frozen peas for snap peas. I really liked it. Hubby said it needed more soy sauce. The flavor was good but not overpowering. The kids liked it too. I had to get alot of the ingredients because I didn't have them, but it was worth it!